1) What are the differences between pro and minimal version? IPTV Panel Pro has been remade almost from scratch, and we did improvements in almost every part of our code. - Load Balancing by addind servers. 2) Can I purchase lifetime License to the pro version? 3) Can I upgrade my old version to pro version? Yes, at any time. We can manage the update for you. There is a small fee for this. Please contact us if you feel ready for the upgrade from our Tickets System. 4) Do you offer a Server along with my purchase of your software? No. We only offer the software and nothing else with it. The +1 external server which is mentioned in the IPTV Panel Pro means that you can add one external server for free and enable the load balancing mode. 5) How many users/streams can I import to the panel? 6) When I try to add new Stream i get an error "Please complete all the fields". Why? It's because you forgot to put your server into Load Balancing Chart. Just do a single click at your server and you are done. 7) Load balancing Chart? What this feature is doing exactly? 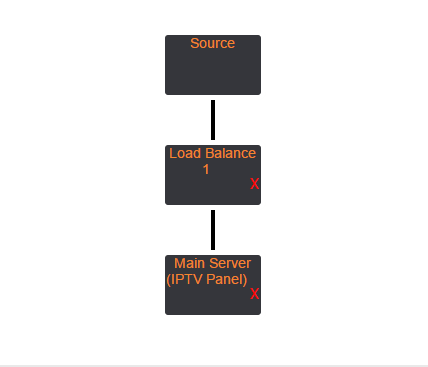 As stated before, IPTV Panel Pro has load balancing mode that will redirect your users automatically to other servers in case of huge load. The load balancing chart is being used to control the SOURCE flow. In a few words how the stream source will be transfered to your Servers. Both servers will take the Stream from the Source. In this case , the server "Load balancer 1" will read the stream from the source and in the same time it will transfer the same stream into the second server. 8) I added load balancing to one of my stream and both have status "Restream error". Why? Taking the Stream directly from source counts as one (1) connection to the source host. 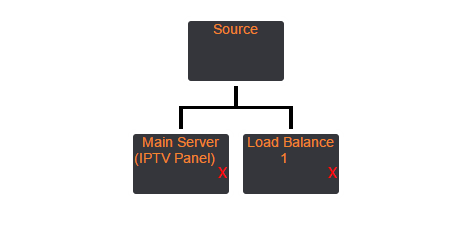 That means if you configure your flow chart as in the first example shown above, your IPTV Panel will open 2 different connections. If the remote host is allow you to use only 1 connection then it will be impossible for you to read the stream in both servers. 9) What will happen if i select to transcode a stream while i'm using the load balancing flow chart? server in the SOURCE, and all the others servers below that server. So only one server will have increased CPU in this case. 10) I'm about to transcode a Stream. What Video & Audio Codec should i use? As you can see we added many video & audio codecs but not all these codecs are supported for IPTV use. You should always use the H.264 as video codec and AAC as audio codec for IPTV use. 11) I see a lot of CPU usage after transcoding a stream. Why? Transcoding uses a lot of CPU Power. If your server can't handle it, then unfortunately you have to disable it. 12) I'm about to Add New Movie. What container should i choose ( mp4 or mkv ) ? MKV, the file format for Matroska Multimedia Container, is an open standard free container format, a file format that can hold an unlimited number of video, audio, picture or subtitle tracks inside a single file. It is intended to serve as a universal format for storing common multimedia content, like movies or TV shows. MKV can hold all of the same digital elements of MP4. MKV can also compress high quality videos into smaller files. MP4 is short for MPEG-4 and succeeds the MPEG-1 and MPEG-2 formats. Like MKV, it's a container format because it includes video, audio, images, playlists, chapter markers and subtitles defined by MPEG. This container format allows to combine different multimedia streams into one file. This file format is created to contain timed media information in a flexible, extensible format in order to interchange, manage and edit multimedia. MKV opens faster while MP4 not. MP4 is more widely accepted than MKV. Every movie must be encoded before you are able to use it. This is happening only for the very first time. The encoding is fast , it takes about ~10,~15 mins to be completed if you have set the "Read Native Frames" setting to NO. 14) I decided to transcode an already imported movie. Can i ? Of course. Press the edit icon under the movie you want to edit. You can change the transcode attributes or the container. After that you need to re-encode your movie for your changes to take effect. 15) Where is the MAG portal Located? 16) My clients are using Android/iOS. Any solution for this? Clients can login with their line details. 17) Some streams don't have picture in client area. Why? Client area is using the HLS Container. The standard codecs for HLS are the H.264 video codec and the AAC audio codec. If your stream has different codecs you need to transcode to these codecs to be fully playable on the client area. 18) I can only open 1 connection using HLS container although i have set the max connections more than 1. It's not a bug it's a feature. The HLS container works only with 1 connection and does not depends on the max connections value. We added HLS only for compatibility reasons. You should always use the MPEGTS container. 19) I'm taking a Stream from someone else and he is using the PRO panel. Will my stream be delayed for the number of seconds that the remote panel has in pre-buffer setting? No. IPTV Panel reads by default all the LIVE Streams in non native frames unless you changed it. That means your panel will instantly download the pre-buffer data and it will continue as live stream. So, there is no delay for you. 20) I want to import a movie as a live stream. Can i do that? Sure you can. Just be sure to Enable the "Read Native Frames" setting. 21) In my Dashboard the Input/Output flow doesnt work corrently. It always says 0 bytes. It's because you need to specify the Network interface for the server you are using. Go to Manage Servers -> Edit Server -> Select network interface. 22) I get Source Down in some streams. Why? Source down means that the panel can not communicate with the remote host OR the remote stream isn't a valid stream. If you are 100% sure that the stream is playable (you can try it in your VLC for example), then the remote has probably blocked your server IP. 23) What kind of technology you are using for restreaming? 24) Can i remove Copyright ? Yes you can buy a copyright remove plugin by visiting http://xtream-codes.com/ under my services and Addons. 25) Is the domain name required to be set in my external/main servers? No. You can leave it blank if you wish, but if you specify a domain name be sure that it is valid otherwise it will cause problems. 26) I downloaded the bouquet file but contains only the domain/ip of my main server. Shouldn't have some of my load balancer servers there? No. Your main server redirects the users to your other servers so every request must be pass from the main server first.